Powerful LEDs light up the entire disc, not just spots. Spinning produces "lighthouse" effect. Durable construction resists damage from rough surfaces. Sonically welded lighting module. Long life, replaceable batteries. Contoured rubber edge enhances grip and assures soft catches. Low profile for long distance flights. Soft rim is great for dogs. 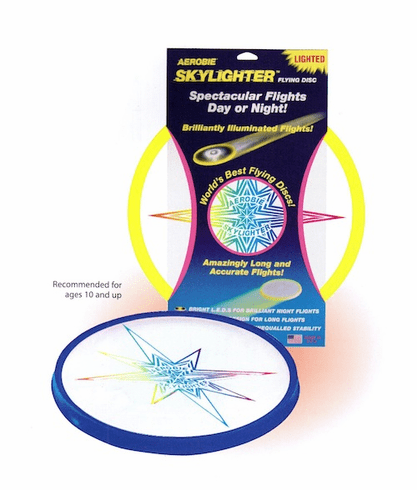 Extra large diameter and patented spoiler rim produce accurate, wobble free flights. Great for players of all skill levels. Low profile for long distance flights. Made in USA. Ages 10 and up.